It seems impossible to upload our iTunes purchased m4v movies on internet like Youtube, Facebook because of the iTunes DRM protection. But now you don't need to put up with the inconvenience caused by the annonying DRM. NoteBurner M4V Converter Plus can easily help you get rid off the DRM protection and convert iTunes movies to Youtube web video formats. With the large number of people like sharing their own video on internet, and Youtube as the most popular video sharing website around the world, there is the pressing need for an application which can help us share our iTunes purchased or rented movies on Youtube, Facebook. 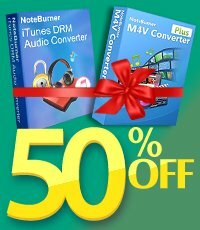 NoteBurner M4V Converter Plus (For Mac & For Windows) appears at the right time. 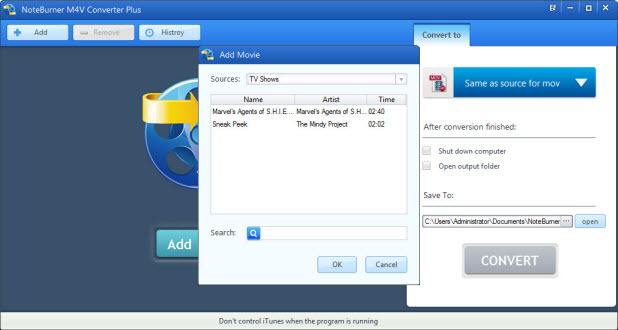 As an innovative DRM removal tool, NoteBurner M4V Converter Plus allows both Mac and Windows users removing the DRM protection from iTunes purchased and rented m4v movies or TV shows. Further more, it helps you convert iTunes DRM-ed videos to all popular mobile devices, and even web video formats for embeding the converted videos on your website, uploading the iTunes videos to Youtube, Facebook, Dailymotion or other video sharing websites. In this article, we will walk you through how to convert iTunes videos to web video formats and upload to Youtube. Preparation: Download NoteBurner iTunes drm video to Youtube converter. And please check if you are running the latest version of iTunes. When you start the NoteBurner DRM M4V Converter Plus, the iTunes will automatically run together with the program. Click add button and then choose M4V movies from iTunes library. Actually, Youtube website can be compatible with many stream media formats, like MP4, WMV, FLV etc. But to make it 100% successful, we still recommend you to select the "Web Video - Universal Flash Video Movie" option. Click the dropdown list on the right, under the "convert to" section, locate the mouse on the "Web Video" icon, then you get the correct option. Step 3. Click Convert Button to Start Converting iTunes M4V video to Youtube. Click the convert button, then you will get a DRm free iTunes video soon in FLV formats. You can easily upload the converted video to Youtube or Facebook and anywhere online you want.